About 200 people gathered Sunday for a protest procession against the arrest of six alleged “neo-Nazi” who have been arrested for attacking youngsters in a tram in the Bulgarian capital. On June 6, boys with hoods on attacked four people between 17 and 23 years of age, who were on their way to a rally against the illegal detention of foreigners at the Special Center for Temporary Accommodation of Foreigners in the Sofia suburb Busmantsi, widely known as the Bulgarian Guantanamo. According to the Prosecution's Office, the attackers were Dimitar Lazarov, Vasil Pavlov, Matey Penev, Emil Aleksiev, Rosen Kanev, and Mario Abdel Gamal. The Sunday rally has been organized through a group in Facebook, which gathered 160 supporters. 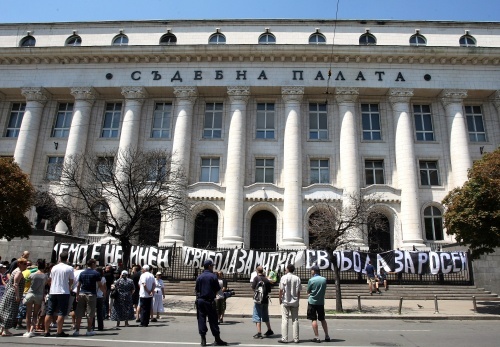 The protest started from the National Palace of Culture and ended in front of the courthouse, where the protesters have put posters of the fense saying “Freedom for Mitko” and “Freedom for Rosen”. Many of the protesters have worn t-shirts saying “Emo is innocent”, “Justice for Rosen” and “Justice for Mario”. The parents of some of the accused have also joined the rally. According to them, the boys have been set up and the real perpetrators have not been found yet. The father of one of the arrested boys has claimed that his son has been home at the time of the incident. He said he does not have an explanation why his son's name was on the defendants' list. Rosen Kanev's mother has also claimed her son was home all day on June 6. At the rally, she has been wearing a t-shirt saying “The true perpetrators are free, the innocent are in jail”. According to her, the attack in the tram has been done by an ambassador's son and Rosen was only a scapegoat. Rosen's friends have admitted he had hooliganism activities in the past but in their words, they had nothing in common with the attack in the tram. “If his file was clean, he would not have been arrested because there are no proofs for his guilt,” said one of the protesters and added that Rosen will be in jail until September because the judges were “on vacation”. Other participants in the rally have also wondered if there were other proofs against the six boys except that the victims have recognized them in photos. Some protesters expressed their concerns that the arrests have been done only in order to prove that the Bulgarian police is working effectively. “The boys have been caught in a situation where each one of us may fall too and this is why they should be supported,” the protesters said.